One of the classic New York City tourist destinations is Central Park, a landmark of innovation in landscape architecture and engineering. However, most tourists and maybe a few residents may not be aware of other equally inspiring parks located in New York City. 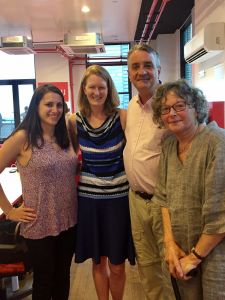 During the GreenhomeNYC July Forum, Eloise Hirsh, President of the Freshkills Park Alliance, and Noreen Doyle, Executive Vice President of Hudson River Park Trust, spoke about two large revitalization projects in New York City that are transforming abandoned infrastructure into natural havens for communities. Hirsh and Doyle spoke about the history of these parks, detailing the journey, challenges, and upcoming projects. Eloise Hirsh and her seven-member team have worked with limited resources and tough environmental challenges to reshape the terrain and public image of Freshkills in Staten Island. 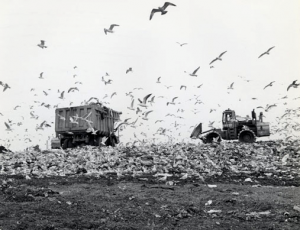 Formerly the world’s largest landfill during its time of operation, Fresh Kills was an eye sore and a spot of heartache in the aftermath of the September 11th terrorist attacks. The sight that most people recall when hearing the name Fresh Kills is the image to the right. However, in 2001, the Municipal Arts Society of New York went to then Mayor Rudy Giuliani with a brighter image. With approval from the Mayor and a draft plan from James Corner Field Operations, a team was assembled in 2006 with Hirsh at the helm. In the past decade, Hirsh and her team have reclaimed and remediated about 30 acres of land, starting from the outer edges in order to give the border communities most affected by the landfill the earliest benefit. The image on the left of Fresh Kills Park today is a stark contrast to the image of the landfill during full operation. 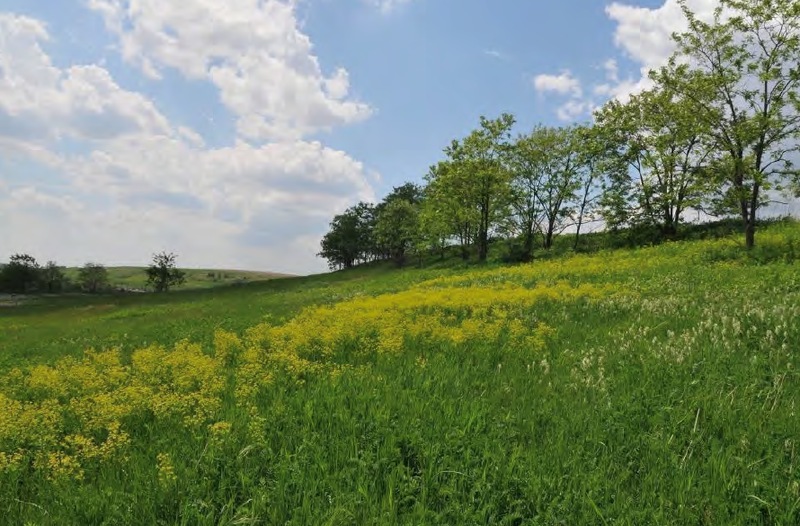 When the project is complete, 2,200 acres of former landfill will become recreation area for Staten Island residents, natural habitat for local species and more importantly, a shining example of New York City’s resilience. Freshkills aligns with New York City’s goals to reduce the amount of waste it produces and educate its residents about land conservation. When completed, Freshkills will be almost three times the size of Central Park and the world’s largest landfill-to-park reclamation project. 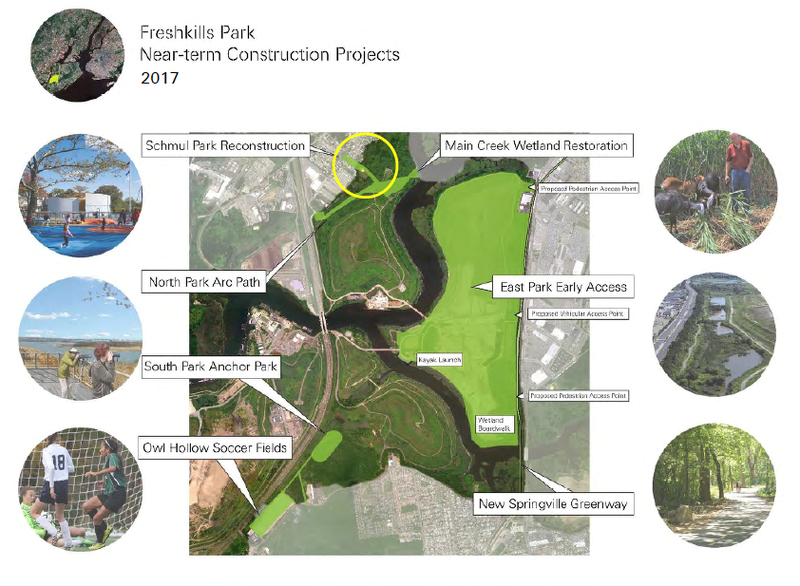 The goal of Freshkills is to serve as inspiration and an example for similar projects around the world. Hirsh also discussed the many projects that have been completed so far, as well as the projects that are in progress. The map below shows the various projects that have been in construction since 2012 – and there are more projects on the horizon! Some of the amazing projects that Hirsh highlighted were the education, research and outreach programming that takes place at Freshkills. The park offers Discovery Days, Kayak Tours, park runs and bird watching. It also provides the unique opportunity for scientists to conduct research on a variety of subjects ranging from the study of migratory bats to fast-growing trees. Parks come in all shapes and sizes and do not necessarily have grasslands or ponds. Sometimes, parks are built on the bones of a once bustling ship industry. 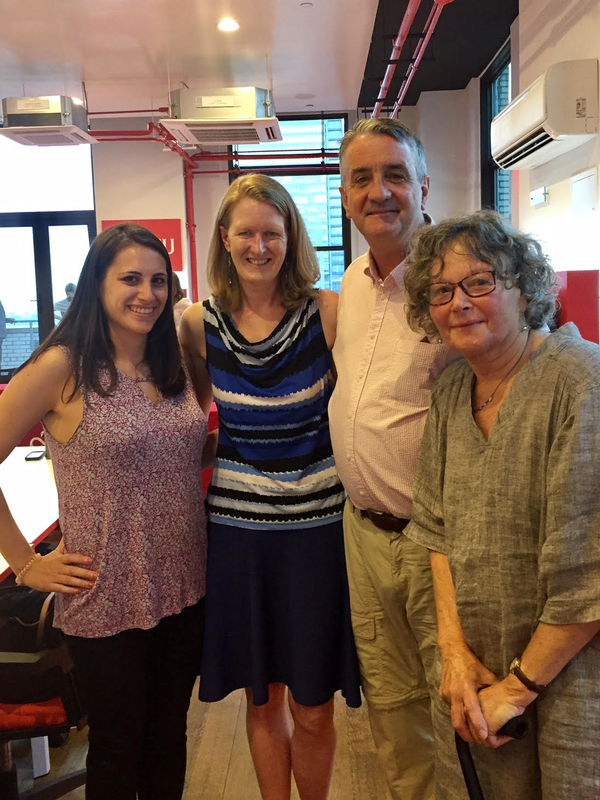 Noreen Doyle spoke about the Hudson River Park, a 550-acre area along the Hudson River that also includes over 400 estuarine water acres. The park provides a variety of recreational activities, water activities, restaurants, events and entertainment. This park was born from the signing of the Hudson River Park Act in 1998 as a replacement project for the abandoned Westside Highway. The act established the area as parkland and created the Hudson River Park Trust to develop and maintain the land. Hudson River Park receives nearly 17 million visitors annually with over 100,000 people attending events every year. Unlike typical parks, it consists of piers from Battery Park up to 59th Street, stretching 4.5 miles along the west side of Manhattan. 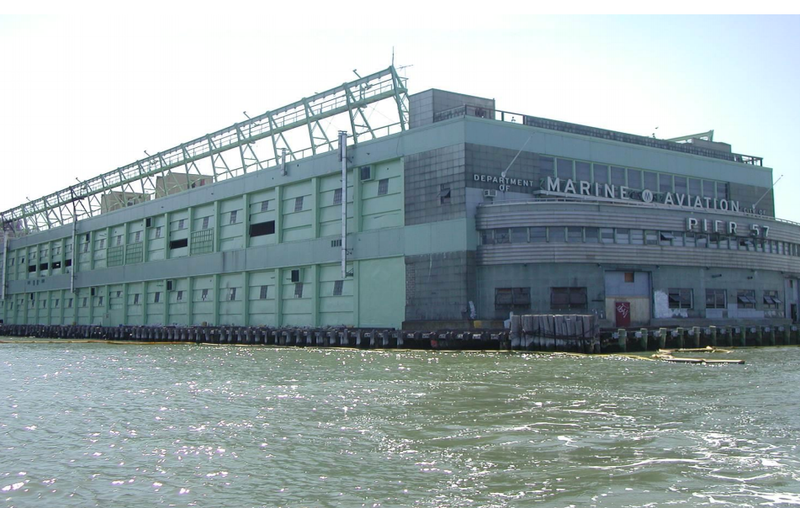 One of the best known is Chelsea Piers, which currently houses the Chelsea Piers and Entertainment Complex, offering New Yorkers a wide-range of facilities from golfing, to rock climbing walls, skating, basketball and more. 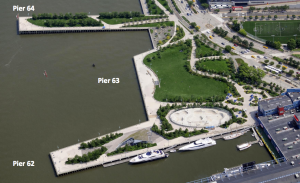 Other famous piers include Pier 25, the longest pier with mini golf and a children’s playground; Pier 45, a popular outdoor spot particularly for sunbathers; and Pier 86, which houses the Intrepid Museum. 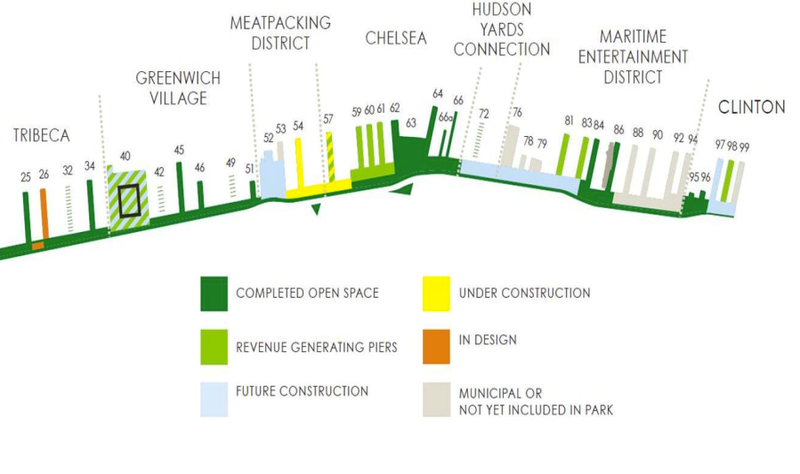 The graphic below details the construction progress of the Hudson River Park. Doyle also spoke about the upcoming projects that are in progress. 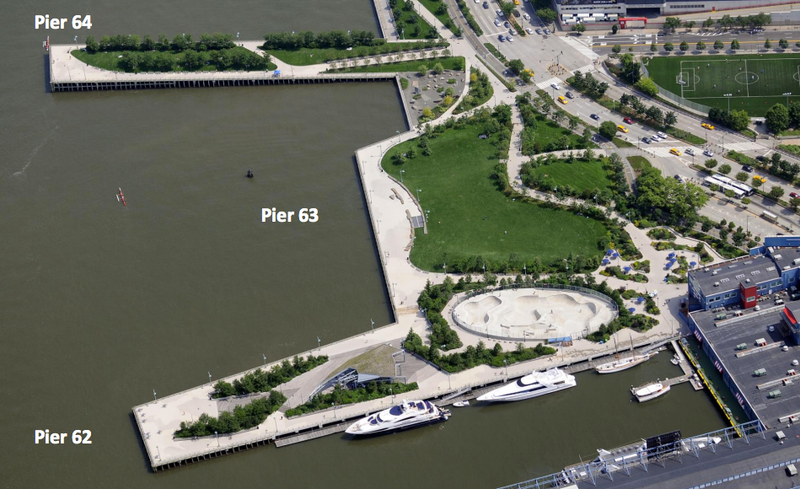 At Pier 26, the Hudson River Park Trust is currently developing designs for an educational center with an ecological focus. The concept is to create a miniature, or what Doyle refers to as “boutique-scale”, wetland habitat to offer residents the opportunity to learn about the local ecosystem. The plans also include opportunities for visitors to get down to the water’s edge and experience the Hudson’s ecology up close to learn the importance of habitat conservation. In addition, the concept plans include an estuarium to teach visitors about the ecological history of the Hudson and to provide opportunities for further research in this unique environment. Another project currently in the works is the former bus depot at Pier 57, which will become the future home of Google in 250,000 square feet of office space. This pier has the unique advantage of being the only pier in New York with a basement. The original structure was constructed and floated down the Hudson to its present location at 15th Street. The plan is to also create a marketplace on the bottom floors, which is scheduled to be complete by 2019. Doyle explained the challenges the Hudson River Park faces as it continues to develop and rehabilitate more piers along the west side. Money and development restrictions are the main hurdles that the park has to overcome. Per the 1998 Act, the park must be self-sustaining and generate the revenue it needs to maintain its structures and activities. Unfortunately, several piers require serious renovations that eat into the revenue generated. 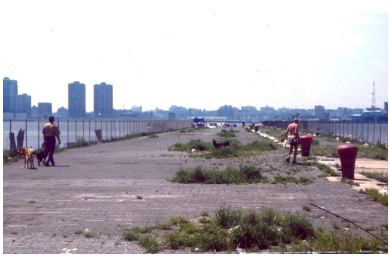 Pier 40, for example, is the largest pier in the park and houses the Hudson River Park Trust’s offices. It generates nearly $7 million in revenue. However, due to structural issues with the piers steel piles, it required nearly $100 million to repair and maintain, which the Trust was able to raise by selling air rights. 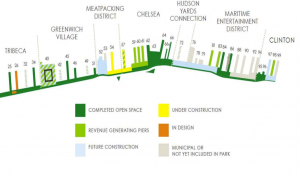 In addition to dealing with failing infrastructure, the park is hindered by the types of projects it can pursue by the constructs of the Hudson River Park Act as well as by local residents, who may prefer less traffic or development. Like Freshkills Park, Hudson River Park offers numerous education and outreach opportunities, using the waterfront as a teaching lab. The park offers history tours, nature walks, volunteer opportunities, summer camp programs and more. Check out the website for more information!